And here's my casing of her card. I found this sweet Bee Bear by Penny Black at a garage sale this summer, and I absolutely LOVED coloring her with my Copic markers. I colored this image a few weeks ago, so I don't remember the Copic markers I used. She'll be fun to color using various coloring mediums, and I think next time I'll watercolor her with my SU reinkers and watercolor brush. I had to flip the sketch to accommodate the size of my image and oval Nestabilities. As a result, my wave within the design doesn't look as cool as Darlene's. I used designer paper from a Memory Big Ideas mat pad. Darlene stamped her sentiment directly onto her designer paper, but I stamped my sentiment, punched it out with my oval punch, and then sponged the inside with Pretty in Pink and the outside with Certainly Celery as I didn't want it to get lost in the stripes of my choice of designer paper. 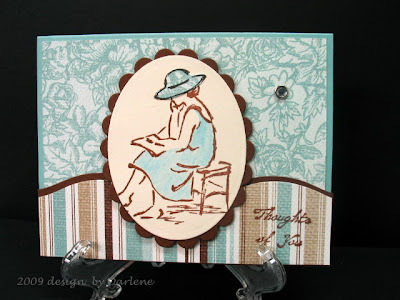 The cute little chocolate flower is from Stampin' Up's button latte' collection. This is also for a Doubledog Dare Challenge issued by my friend, Joan Ervin, to use a glam girl in your creation. I happen to think my sweet bear is glamorous in her own right! Don't you? This is adorable Charlene. I love your copics coloring. I like that you kept the background simple with the wave. It really makes the image pop. Super case. oh how fabulous! your cards ALWAYS look so perfectly put together! just gorgeous! This is adorable Charlene. Such a sweet image, beautiful coloring. Awww, Charlene...this is adorable!!!!! What a precious image and your coloring couldn't be any more perfect!!!!! Hope you had a great weekend, gf!!! This is one sweet little bear, made all the more special because he's a Rescue Bear!! Great find at the yard sale!! He has found a good home!! lovely Charlene....I missed this one! makes me bummed....I gotta go back and do it! You did good!